This book addresses an issue I have been experiencing all my adult life. I have it everyday. It effects me everyday and it make me feel a little bit rubbish about myself, every single day. No money involved in remedying.Time to be addressed? Absolutely. 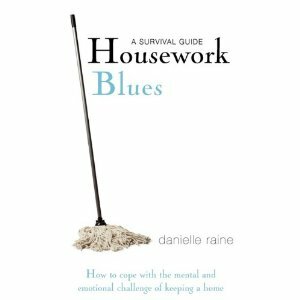 Housework Blues tackles our sorry, despairing, sad, often hate filled relationship with domestic tasks. Okay I know this isn’t everyone’s relationship with their house keeping but I know if your reading this review it’s probably because you identify with this issue at least a little. This isn’t a book of household tips and tricks although it does contain a few pearls…No, it is about tackling your blocks. I identified most with the section on motivation (my lack of) and Danielle soon whipped me into shape. She writes very intelligently drawing on philosophy, psychology, research, religion, literature and on her own battle with these issues. She told me to focus on the end results not the job in hand. A serene home is a great motivator. She also talked about rewards. Today I cleaned the bathroom floor (properly!) my reward was 4 gold chocolate coins and a big cup of tea and a phone call to my best friend. Whislt doing it I visualised how fabulous it would feel too finally have done it and how lovely it would look when my guests came . Both worked…I actually did it!! Danielle also considers blocks to housework in chapters dedicated to feeling overwhelmed, injustice, futility, no energy, boredom, inferiority and superiority and lack of motivation. Yep she covers it all and suggest lots of strategies to overcome and sound reasons such as good health and pride to encourage you through. A brilliant much needed book! This book looks amazing. I dont have any psychological blocks when it comes to housework but I know plenty of friends who do – a perfect buy I tihnk for them!